The dogma of the Holy Trinity is the second fundamental dogma of Christianity. It is not incidental, therefore, that the most serious doctrinal struggle the Church of Christ has ever known in all her history was over the question of the Trinity. In the fourth century, a priest in Alexandria by the name of Arius, attacked the historical faith of the Church with the belief that, “There was a time when the Son of God was not.” He insisted that the Son of God was not truly God; He was merely the highest of created beings, and in that sense we could call him a god. This belief is virtually identical to the present day heresy of the Jehovah’s Witness. The Church, so it seemed, appeared to be almost split into two; for up to that time, there were no significant divisions in all of Christendom. A great council of the whole Church finally had to be called in A.D. 325 in the city of Nicea (near what is present day Istanbul, Turkey). More than three hundred bishops gathered, plus hundreds of priests and deacons from all over the Roman Empire. We will defer further discussions surrounding this great event in the history of the Church to when we talk about, The Divinity of Christ and The Council of Nicea. However, we will only conclude by stating that the dogma of the Holy Trinity is of vital importance to our understanding of Redemption and Salvation. That is, it is not just a matter of difference in opinion and interpretation, but that the whole of our understanding of Redemption and Salvation is built upon the correct doctrine of the Holy Trinity. This is why such a heresy in the early Church as to the Divinity of Christ brought so much attention and uproar. Because the dogma of the Holy Trinity is the most important of all Christian dogmas, it is at the same time the most difficult for the limited human mind to grasp. God is one in Essence but triple in Person. A working definition of two terms is invaluable to our comprehension–both in mind and in heart–of the Trinity. These two words are: essence (or nature) and person. The concept of nature can simply be defined by looking at a child and an animal such as a frog. How is it that you can distinguish the child apart from the frog? By identifying the nature each possesses. The child has human nature and the frog has frog nature. There are certain essential characteristics common to humans. Humans have a particular type of hands, feet, eyes, arms, and legs, all arranged in a consistently predictable fashion. Each one also has a soul, that is, a mind, a will, emotions, etc.. The term nature refers to that set of common essential characteristics possessed by a whole group, or type, and which sets that particular group off from all other groups. This is how we distinguish the boy from the frog. Question number two is: How can we distinguish one boy from the other? Nature, with its essential characteristics, refers to that which is common to a group, but it does not deal with that which distinguishes subjects within a group. For that we need to look at the non-essential characteristics. Humans come with a certain set of essential characteristics. But there is the potential for an almost infinite variety of sizes, shapes, colors, and capacities–that is, non-essential characteristics. Now at this point we can be satisfied with our distinction between one frog and another. But in no way have we finished distinguishing between one human and another. We would have a limited reality if we confined all that is different between human beings to a different set of non-essential characteristics of human nature. So, question number three is: Does the fact that two boys have two different sets of non-essential characteristics completely establish all that is different about them? To answer this question we need to define person. The answer to the above question is no. Not only do all of us have our own packages of non-essential characteristics of human nature, but each of us also has his own unique God-made, God-given person. That person literally underlies all else there is about us. It is the bottom line of who we are. It is person that ultimately accounts for the difference between humans. Several things can be said about this matter of person that can help bring the concept into focus. First, both person and nature, although definitely distinct, are never separate except as abstract concepts. The two are necessary to form one complete, whole human being. Second, person is God-made and God-given for each of us directly. Nature we inherit from God through our parents. Your person is the unique creation of God for you only. There are never two the same in person. Third, it is your person that allows you to be a free, responsible, moral being. Nature by itself would be subject to determinism. Person is not. Fourth, we cannot define the full content of person. There is an element of mystery about each person. Now that we understand the difference between nature, or essence, and person, let us apply them to our understanding of the Holy Trinity. God is one in essence, yet three, Father, Son, and Holy Spirit, in persons. There is eternally in God true unity, combined with genuinely personal differentiation: the term ‘essence’, ‘substance’, ‘being’, or ‘nature’ indicates the unity, and the term person indicates the differentiation. Father, Son, and Holy Spirit are one in essence, not merely in the sense that all three are examples of the same group or general class (as with human beings), but in the sense that they form a single, unique, specific reality. There are no variety packages of non-essential characteristics. There is in this respect then an important difference between the sense in which the three divine persons are one, and the sense that three human persons may be termed one. Humans, however closely they co-operate, each retain their own will and their own energy. In short, they are three men and not one man. But in the case of the three persons of the Trinity, there is distinction but never separation. Father, Son, and Holy Spirit, have only ONE will and not three, only ONE energy and not three. None of the three ever acts separately, apart from the other two. They are not three Gods, but one God. Yet, although the three persons never act apart from each other, there is in God genuine diversity as well as specific unity. We believe that this threefold differentiation in God’s outward action reflects a threefold differentiation in His inner life. Father, Son, and Holy Spirit are not just “modes” or “moods” of the Divinity, not just masks God assumes for a time in His dealings with creation and then lays aside. They are on the contrary coequal and coeternal persons. A human father is older than his child, but when speaking of God as ‘Father’ and ‘Son’ we are not to interpret the terms in this literal sense. We affirm of the Son, “There was never a time when he was not.” And the same is said of the Holy Spirit. The Father is the Fountainhead of the Holy Trinity. He is not an unapproachable, vague, religious substance far removed from earth in some distant, dark, recess of heaven. He is a person who is ever-present, who knows and loves, and who is to be known and loved. Christ said, “If anyone loves Me, he will keep My word; and My Father will love him, and We will come to him and make Our home with him” (John 14:23). The other two persons are each defined in terms of their relationship to the Father: the Son is ‘begotten’ by the Father, the Spirit ‘proceeds’ from the Father. Both ‘begetting’ and ‘procession’ are from all eternity, outside of time. The dogma of the begetting of the Son and the procession of the Holy Spirit from the Father shows the mystical inner relations of the Persons in God and the life of God within Himself. We must never forget that one of our Lord Jesus Christ’s objectives was to bring people to His Father as well as Himself.. He said, “I am the Way, the Truth, and the Life. No one comes to the Father except through Me” (John 14:6). The second Person of the Holy Trinity is the Son of God, His ‘Word’, or ‘Logos’. The concept or name “Word” has its foundation in the first chapter of the Gospel of St. John. The third Person is the Holy Spirit, the ‘wind’, or ‘breath’ of God. While understanding the inadequacy of neat classifications, we can say that the Spirit is God within us, the Son is God with us, and the Father God above or beyond us. Just as the Son shows us the Father, so it is the Spirit who shows us the Son, making Him present to us. Christ said, “But when the Helper (i.e. the Holy Spirit) comes, whom I shall send to you from the Father, the Spirit of truth, who proceeds form the Father, He will testify of Me” (John 15:26). He also made it clear that the Holy Spirit can be known personally when He said concerning Him, “And I will pray the Father, and He will give you another Helper, that He may abide with you forever–the Spirit of truth, whom the world cannot receive, because it neither sees Him nor knows Him; but you know Him, for He dwells with you and will be in you” (John 14:16, 17). “O Heavenly King, the Comforter, the Spirit of truth who is present in all places and fills all, the treasury of good things and the Life-Giver, graciously come, and dwell in us and purify us from all defilement, O Good One, and save our souls” (The Agpeya – Third Hour). Let us try to illustrate the doctrine of the Trinity by looking at the Triadic patterns in salvation history and in our own life of prayer. 1. Creation. By the Word of the Lord the heavens were made, and all the host of them by the breath of His mouth (Ps. 33:6). God the Father creates through His Word or Logos (the second person) and through His Breath or Spirit (the third person). The ‘two hands’ of the Father work together in the shaping of the universe. Of the Logos it is said, all things were made through Him (John 1:3); of the Spirit it is said at the creation He brooded or moved upon the face of the deep (Gen. 1:2). All created things are marked by the seal of the Trinity. 2. Incarnation. At the annunciation the Father sends the Holy Spirit upon the Blessed Virgin Mary, and she conceives of the eternal Son of God (Luke 1:35). So God’s taking of our humanity is a Trinitarian work. 3. The Baptism of Christ. In the Orthodox tradition this is seen as a revelation of the Trinity. The Father’s voice from heaven bears witness to the Son, saying, This is My beloved Son, in Whom I am well pleased; and at the same moment the Holy Spirit, in the form of a dove, descends from the Father and rests upon the Son (Matt. 3:16-17). 4. The Transfiguration of Christ. This also is a Trinitarian happening. The same relationship prevails between the three persons as at the Baptism. The Father testifies from heaven, This is my beloved Son, in Whom I am well pleased; hear Him (Matt. 17:5), while as before the Spirit descends upon the Son, this time in the form of a cloud of light (Luke 9:34). The Father sends down the Holy Spirit, to effect the Son’s presence in the consecrated gifts. Here, as always, the three persons of the Trinity are working together. Genesis 1:26: “And God said, Let us make man in Our image, after Our likeness.” The plural number here indicates that God is not one Person. We have already discussed the manifestation of God in Trinity in the Incarnation, at the Baptism, and at the Transfiguration. The doctrine of the Trinity should not be pushed into the corner and treated as a piece of theology only of interest to specialists. It should have a tremendous impact on our daily lives. Made after the image of God the Trinity, human beings are called to reproduce on earth the mystery of mutual love that the Trinity lives in heaven. 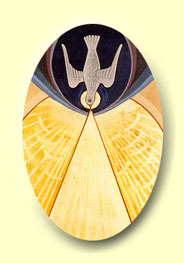 Each social unit–the family, the school, the workplace, the parish, the universal Church–is to be made an icon (image) of the Triunity. Because we know that God is three in one, each of us is committed to living sacrificially in and for the other; each is committed to a life of practical service, of active compassion. St. John Chrysostom says, “The most perfect rule of Christianity, its exact definition, its highest summit, is this: to seek what is for the benefit of all. I cannot believe that it is possible for man to be saved if he does not labor for the salvation of his neighbor.” Such are the practical implications of the dogma of the Trinity. That is what it means to live the Trinity. This article was written by Fr. Kyrillos Ibrahim for coptichymns.net.